Each year, all of the Hong Kong based Hash House Harrier clubs, now numbering 14, organise a joint Hash to raise money for Operation Santa Claus organised by the South China Morning Post (SCMP) and Radio Television Hong Kong (RTHK). The event is held on a Sunday in early December and involves a 1 hour plus cross-country run, or Hash, for all ages and standards of fitness where the runners, or Hashers, follow a pre-laid trail. Following the run there will be a ‘Circle’ where the Grand Master of the event will hand out various punishments or, DownDowns, for Hashers who have committed misdemeanours on the Hash such as short cutting or wearing outrageous running kit. During the Circle a raffle is held for prizes donated by various sponsoring establishments / organisations. Once the Circle finishes an OnOn or Bash is held, typically with buffet style food to replenish those lost calories. Typically, well over 100 hashers take part and from humble beginnings recent years have seen us raise around HK$60,000 each year for Operation Santa Claus by contributions from the different Hash clubs, the raffle and sponsoring establishments / organisations. The Hash House Harriers was founded in 1938 by a British man named Albert Stephen Ignatius Gispert in Malaya. He gathered together several expatriates to form a group in Kuala Lumpur and the group received its name from the Selangor Club Chambers, which due to its lacklustre food was commonly referred to as the 'Hash House'. Hashing is similar to the old sport of Hare and Hounds where the Hare lays a paper or chalk trail and the remaining pack of Hashers follow the trail across country tracking the Hare. There are currently almost 1500 hashes, including groups in almost every major city in the world, and Hashing has developed into a truly worldwide culture with its own traditions, rituals and myths. Hashing is not just about running but about meeting friends and having a great time. It’s not without good reason that a Hash is often referred to as a "drinking club with a running problem". Operation Santa Claus (OSC) is an annual charity campaign jointly organised by South China Morning Post (SCMP) and Radio Television Hong Kong (RTHK). The campaign seeks to raise funds and awareness for Hong Kong charities over the winter festive season. In 2012 Operation Santa Claus celebrated its 25th anniversary. From a modest beginning in 1988, Operation Santa Claus has raised more than HK$154 million in cash, goods and services, which helped over 119 needy groups and charities in Hong Kong. Santa Hash is proud to have been supporting Operation Santa Claus since the beginning, the first Santa Hash being held on 18 December 1988. The Campaign is a community event, and throughout December, corporations, clubs, schools and individual donors, the elderly and children, all united under the banner of the annual charity appeal for the city’s needy by organizing a series of creative fundraising activities. Articles are published daily in SCMP and aired by RTHK’s Radio 3 for a number of weeks in advance of the Christmas holiday season. The first weeks mainly focus on introducing the selected beneficiaries, while the whole month of December covers the series of donor fundraising events as well as beneficiaries issues. Primary coverage is in the City Section of SCMP, but news can also be reported in various sections of the newspaper, including the front page, Editorial, Business, Education, Sports and Features. The Young Post may also publish the various creative and fundraising activities organised by some of the participating schools. The online edition of SCMP - scmp.com - features a special Operation Santa Claus section, showing all SCMP coverage on the campaign. The official website (http://osc.scmp.com) for Operation Santa Claus is updated on a daily basis during Operation Santa Claus, providing first-hand information, news and photos relating to the campaign. It also includes podcasts and vidcasts and collects on-line donations. Some of the OSC events are also covered by the local newspapers, magazines and TV. Little Life Warrior Society Ltd.
Operation Smile - China Medical Mission Ltd. In 2014 Santa Hash raised over HK$70,000 for Operation Santa Claus, including HK$25,000 from the '12 Hashes of Christmas' organised by Moonie & Tin Tin from Sek Kong H3..
A write up of Santa Hash 2014 is on the Operation Santa Claus website, here. 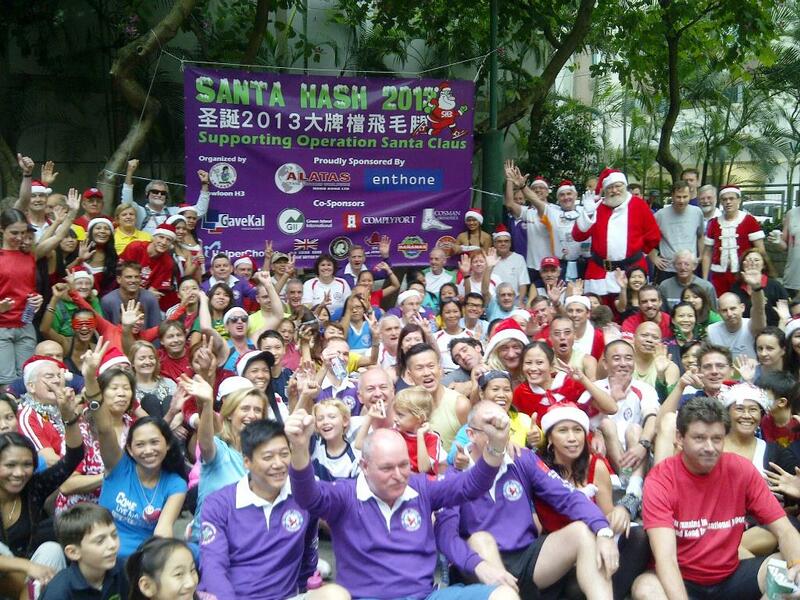 In 2013 Santa Hash raised HK$70,000 for Operation Santa Claus. A write up of Santa Hash 2013 is on the Operation Santa Claus website, here. In 2012 Santa Hash raised HK$65,000 for Operation Santa Claus. A write up of Santa Hash 2012 is on the Operation Santa Claus website, here. In 2011 Santa Hash raised HK$45,000 for Operation Santa Claus. A write up of Santa Hash 2011 is on the Operation Santa Claus website, here. In 2010 Santa Hash raised HK$65,000 for Operation Santa Claus. A write up of Santa Hash 2010 is on the Operation Santa Claus website, here. In 2009 Santa Hash raised HK$60,000 for Operation Santa Claus. A write up of Santa Hash 2009 is on the Operation Santa Claus website, here. In 2008, Santa Hash raised HK$78,220 for Operation Santa Claus. A write up on the day, courtesy of the Wanchai Hash Trash, can be found here.